The elegant and majestic town of Aix-en-Provence is situated in the far South-East of France and once served as the capital of Provence. It is now a highly esteemed and lively University town. The locals refer to their town as Aix (pronounced like the letter 'x'). It has become a very popular and fashionable place in which to live. The city began its life as a Roman camp and was made capital of Provence in the 12th Century. Aix blossomed under the rule of Good King Rene who made it a centre for art and learning. There is still a great deal of history to discover in Aix. The town has some 200 historical mansions dating from the 17th and 18th centuries. 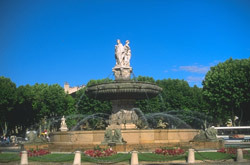 Aix is a very pretty city with an array of parks, squares and fountains dominating the town centre. The buildings are predominantly yellow in colour, like many Provencal towns. What makes this town unique, however, is the abundance of Italian Baroque architecture. Brush up on your French! The town's residents total around 130,000, of which 30,000 are students. During the summer, most of the full time students leave to be replaced by tourists who come from all over the world. The University's summer language courses attract mainly Americans seeking to polish up their French. It's probably best not to use a car here, as traffic can be very busy. However if you do find yourself you in a jam, there's plenty of time to admire the picturesque boulevards that lead traffic in and out of the city. Alternatively, you could just use Aix's public transport, which is clean, efficient and convenient. British airways and Easyjet both have regular flights to Marseille. Alternatively, you could try taking France's incredibly fast and comfortable train service, the TGV, straight to Aix-en-Provence. Aix-en-Provence has a very strong and stable rental market. A property costing 180,000 euros can attract about 13,500 euros in rentals per month. 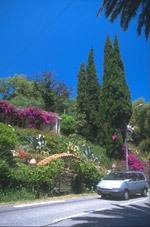 Most properties in the town have high prices and the majority have swimming pools. Do you know Aix En Provence better than we do? Do you have photos of Aix En Provence? WHERE IS Aix En Provence? Access: Has its own TGV station. The Nearest airport is Marseille. Economy: Mostly revolves around tourism and the presence of the university. Interesting fact: Italian baroque architecture has heavily influenced the style of the town's 200 historical buildings.